Max Planck Institute scientists examined the transmission behavior of photonic crystal fibers when they were twisted, finding that the transmission of certain wavelengths becomes much poorer when twisted and that changes to certain wavelengths can be controlled through the twist. A simple longitudinal twist converts certain microstructured optical fibers into filters. Researchers at the Max Planck Institute for the Science of Light in Erlangen have measured this effect in detail in photonic crystal fibers and found a theory to explain it. The results of their research will allow new applications in optical communications and the construction of lasers, sensors and light amplifiers. Glass fibers are used generally to transport light over long distances – for example, fast data transmission over the internet. 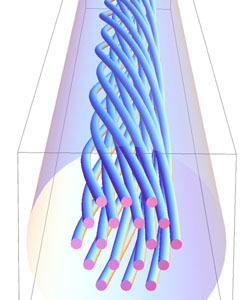 Photonic crystal fibers (PCF) are a novel variant of such optical fibers, currently used mainly in basic research. Their cross-section is reminiscent of a honeycomb: tiny hollow tubes surrounding the core run along the circular fiber. They ensure that the light only travels in the core where it is transported with low loss. The transmission behavior of photonic crystal fibers changes significantly if they are twisted around their longitudinal axis – the transmission of certain wavelengths becomes much poorer. The optical fiber becomes spiral and works like a filter. The behavior can be controlled very easily through the twist: with a stronger twist, the dips in transmission shift towards longer wavelengths. The team of researchers working in Erlangen led by Philip Russell has studied this effect in detail. They secured one end of a PCF and used a motor to rotate the other accurately around its axis while scanning a carbon dioxide laser along to fiber to heat and soften the glass. Light from a supercontinuum source, able to emit light almost equally over a wide range of wavelengths, was then launched into the twisted fiber core and an optical spectrum analyzer used to measure the transmission spectrum, i.e., to find out which wavelengths are suppressed particularly effectively. Russell explains the filter effect with an analogy from the 19th century: in 1878, the English physicist John William Strutt (Lord Rayleigh) noticed that sound was guided in a circular path around the dome of St. Paul’s Cathedral in London. This “Whispering Gallery” effect also exists in optics, for example when light bounces around inside a glass microsphere many times, forming a high quality resonance at certain optical wavelengths. Something similar happens to the wavelengths that are filtered out in the twisted photonic crystal fibers: orbital resonances appear in the honeycomb cladding, causing power to drain away laterally from the core instead of flowing straight ahead, so that only very little of it arrives at the other end. “With a sensitive camera, it would be possible to see the side of the fibers glowing in the colors which are particularly strongly suppressed,” explains Russell. The scientist anticipates interesting technical applications for the effect: “What is particularly attractive about it is that we can twist the PCFs almost any way we want after they have been made. That means, for example, that we have a lot of flexibility in making filters for specific wavelengths.” These components play an important role in many areas: for optical data transfer as well as for sensors, fiber lasers and optical amplifiers. It is also possible to vary the twist along the fibers, which allows many different filters to be created. And finally, this makes it possible to modify the linear and non-linear responses of the fibers and thus influence two important parameters for generating a supercontinuum. Be the first to comment on "Twisting Affects Transmission Behavior of Photonic Crystal Fibers"